Thierry Henry will miss Saturday's FA Cup tie at Highbury between Arsenal and Cardiff City. Boss Arsene Wenger told arsenal.com that Henry will miss out and it's possible Sol Campbell will be rested. Henry and Campbell played in last night's goalless draw at Highbury between Arsenal and Man Utd. The Gunners will face a different test this Saturday when the No'1 team in Wales visit North London. "I will not make many changes because I do not have much choice," Wenger said. 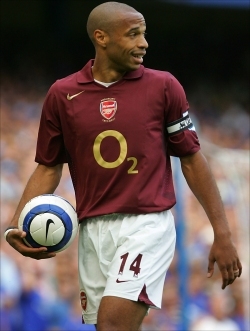 "Thierry Henry will not play, for example, but I hope to have Robin van Persie back and Freddie Ljungberg back, so they will play if they are ready. I will maybe rest Sol Campbell but Philippe Senderos will play."